DudaMobile is a mobile converter developed by Duda. This easy-to-use web service converts regular desktop websites into feature-rich, tap-friendly mobile sites right before your eyes! DudaMobile targets website owners who still have no mobile versions of their site. So, if you feel that your desktop website needs a little brother, and you’re not ready to rebuild your current site in order to make it responsive, join me testing DudaMobile, probably the easiest mobile website builder. Please note: Duda offers two products: DudaOne and DudaMobile. While DudaMobile is a converting software that works with existing websites/Facebook pages, DudaOne is a responsive website builder that creates new, mobile-friendly websites. Unlike other website builders, DudaMobile isn’t about designing and publishing a completely new site from scratch, it’s about making your existing website optimized for mobile browsing. The entire process is ridiculously simple: all you need is to enter your website URL and click the button. 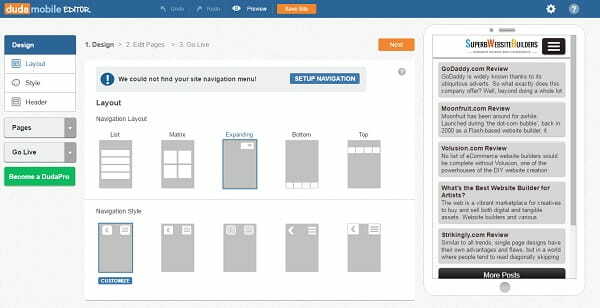 In mere seconds you’ll get access to the editor where you can start changing layouts, headers, page icons etc. You will further be able to edit website pages by dragging and dropping popular, business, design and social sections or elements (like Click-to-Call button, Google Maps, Google AdSense, contact forms, lists, dividers, social network accounts etc.). It’s also possible to adjust SEO and page settings here as well as to add new pages to your mobile website version. The interface is very intuitive and requires no technical knowledge at all. DudaMobile is packed with features, both mobile-specific and standard. Even if you don’t a have a desktop website, you can get a mobile site with Duda – just enter your Facebook page URL, and it will pull its content to your new mobile site. During editing, additional content can be imported from other sources. Mobile-specific features: click-to-call and click-to-text; Google Maps integration that provides step-by-step directions to your brick-and-mortar location; multi-location for businesses across a region; click-to-email. Mobile tracking – DudaMobile has its own tracking application. Navigation layout and style options – the service allows selecting between a variety of navigation layouts (List, Matrix, Expanding, Bottom, Top) and styles (Rounded with Icons, Squared with Icons, Transparent with Icons, Transparent with Arrows or Squared with Arrows). Selection of site background image, text style, heading, buttons. Setting header details on all website pages (type and image selection, resizing, alignment etc.). Advanced web page customization (SEO and page settings, activation of Push notifications, page title choice, content editing, integration of popular, business, design and social elements). Automatic creation of website backup version that can be restored anytime you need that. DudaMobile uses your current website design to create a unique mobile experience that will match the overall style of your web presence. When the automatic version of your mobile site is generated, you can edit it using the drag-and-drop editor; add additional content; hide elements and change navigation – all without affecting your desktop website. The DudaMobile editor provides full access to the source code for increased flexibility and control. DudaMobile offers a self-help center covering various topics. There is also the resource center with cutting-edge industry and technology knowledge base here. If you can’t find the answer within their Help Center, you can contact their support via the editor. Premium Plan users can get phone and live chat support, while other clients may contact the customer support team via the phone. The estimated wait time to get a response by phone constitutes 2-3 minutes on weekdays. Receiving an email with an answer to your question will take a bit longer – around 2-6 hours on weekdays. DudaMobile constantly hosts helpful webinars, which are then posted along with dozens of support videos. The free version of the platform provides users with enough features to customize and publish a good-looking mobile website. Free sites are ad-supported: there’s a tiny DudaMobile advert at the top and in the footer of each page. Besides, you won’t be able to use a custom domain for your site (it will look like this: mobile.dudamobile.com/site/mysitename). 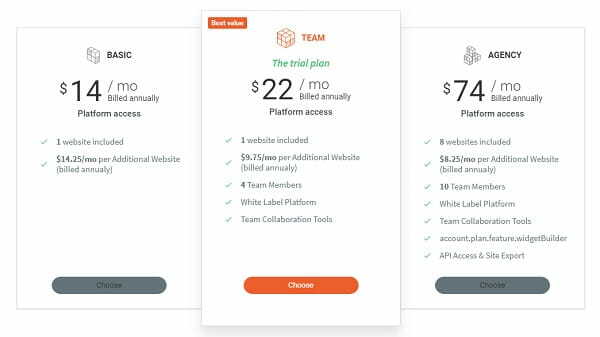 Agency ($74/mo, if billed annually) – includes 8 websites, shared website access for 10 team members, White Label option, multiple Team Collaboration Tools, API Access and Site Export, account.plan.feature.widgetBuilder and opportunity to create an additional website for $8.25/mo billed annually. DudaMobile comes with a set of advantages and drawbacks that may affect the choice of the platform. This is what makes it important for you to be aware of them in advance. 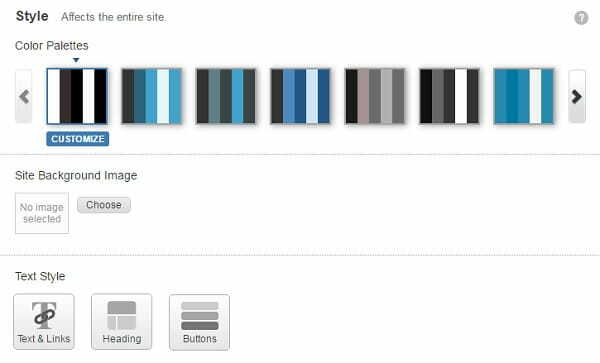 ✔ Detailed web page customization. Question: What will be the domain of my site? Answer: DudaMobile enables you to connect a mobile domain to your site (m.example.com). Initially, your website will be given a default domain (mobile.dudamobile.com/site/example). Question: What will happen to my desktop website? Answer: Nothing. It will remain untouched. Changes made to your mobile site will not be reflected on your main website. However, all changes made to your desktop site will be shown in the mobile version thanks to the DudaMobile auto synchronization capabilities. Question: How will mobile users get to the optimized website? DudaMobile is an easy-to-use mobile website converter. It helps site owners build mobile versions of their standard websites without affecting their design. The system is easy to use for newbies and web design pros as it doesn’t require any special coding knowledge at all. What you have to do is to specify your website URL and watch the way the system converts it into a mobile version. This doesn’t mean, however, that you cannot participate in website customization process. DudaMobile comes with a set of design customization tools, drag-and-drop features, website preview option and other issues that put you in charge of the web design process. DudaMobile works great for website owners, who don’t have mobile versions of their websites yet realize the necessity to launch them. As time goes by, though, the need for responsive websites that fit all the desktop and mobile devices keeps growing, which may somewhat bring down the usability of the system and demand for it. However, if you don’t have a mobile website version yet, using DudaMobile may be a reasonable solution. Don’t wish to bother about creating separate desktop and mobile versions of your website? Then go ahead to explore popular DudaMobile alternatives, the use of which may notably simplify the web building task for you, ensuring decent result.